An illustration of NASA's proposed Deep Space Gateway in orbit around the moon. A NASA request for information seeks ideas from industry on how to develop the gateway's power and propulsion module. As currently envisioned by NASA, the PPE would be the first element of the gateway, launched as a "co-manifested payload" on the first crewed Space Launch System launch, taking advantage of the additional payload capacity provided by the Block 1B version of the SLS. The PPE would go into what is known as a near rectilinear halo orbit around the moon within 100 days of launch. In the RFI, NASA asks potential respondents their ability to produce the PPE, including a "conceptual schedule, rough order of magnitude engineering cost estimate, and recommended contract vehicle" for it. NASA expects to have the PPE delivered to the Kennedy Space Center for integration onto the SLS in December 2021, which would support a launch of the Exploration Mission 2 flight now expected for some time in 2022. NASA hopes that the module can build on early design work for the Asteroid Redirect Mission, whose robotic spacecraft would have also used solar electric propulsion to travel to and from a near Earth asteroid. "Identify a conceptual design you would use as a starting point and what changes you believe are warranted to address PPE capability statements," NASA instructs industry in the RFI. "Through the RFI, we hope to better understand industry's current state-of-the-art and potential future capabilities for deep space power and propulsion," said Michele Gates, director of the PPE effort at NASA Headquarters, in an agency statement. Gates formerly was director of the Asteroid Redirect Mission program. 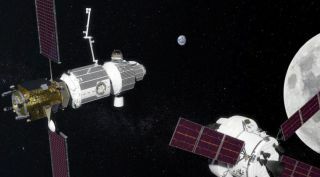 The RFI and planned NextSTEP studies are NASA's next tentative steps in the development of the Deep Space Gateway concept. NASA describes the gateway as "a lunar-orbiting, crew-tended spaceport" that would also include a habitation module and docking ports for the Orion crew spacecraft and separate cargo spacecraft. The gateway's additional modules would also be delivered to cislunar space as co-manifested payloads on future SLS launches.